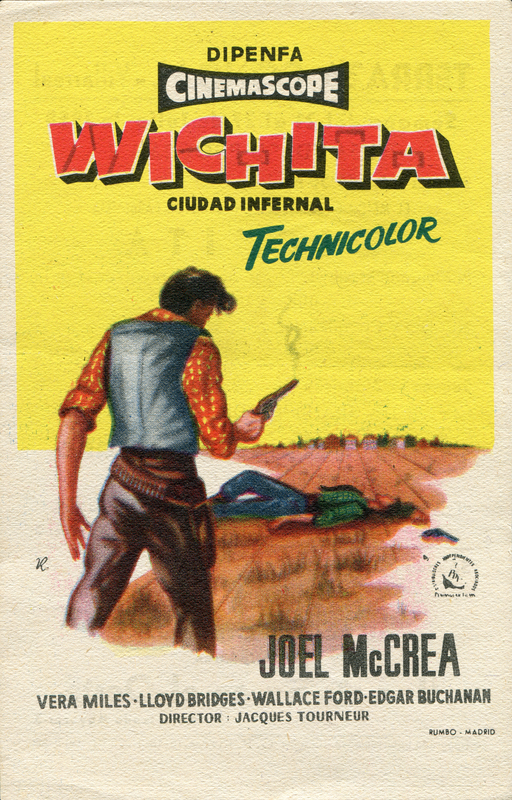 Small, 3.5x5.5-inch movie herald (flier) advertising "Wichita" (Allied Artists 1955). From Spain. Joel McCrea stars as Marshal Wyatt Earp, and Gene Autry's Melody Ranch in Placerita Canyon stars as the title city. The film was released in the U.S. in 1955 and in Spain in 1956. Two-sided, thin buff stock. Four-color front shows the 1-sheet poster art. Back advertises screenings of the film during the week of July 21-27, 1958, at the Terraza Condal (County Terrace) cinema in Villarreal, a city in the autonomous community of Valencia, Spain. LW2648a: 19200 dpi jpeg from original herald purchased 2014 by Leon Worden from a dealer in Barcelona, Spain.